Corporations need more leaders with the skills to meet today's challenges, said William C. Weldon, chairman and CEO of Johnson & Johnson, in a keynote address to Executive Master's Program (EMP) graduates at their convocation ceremony June 14 in Pick Staiger Concert Hall. Weldon's words were no doubt music to the ears of the 132 graduates of EMP-53 and EMP-54, whom Kellogg School Dean Dipak C. Jain referred to as "strong" and possessed of a particularly keen sense of unity in light of a challenging two years marked by corporate scandals, war and an economic downturn. The best leaders, said Weldon, place great importance on customers and market dynamics, but also value innovation, personnel development and collaboration — or "team leadership," as practiced at the Kellogg School. Kellogg students become familiar with the concept of teamwork by learning "not only from faculty but from fellow classmates," Jain told the graduates. 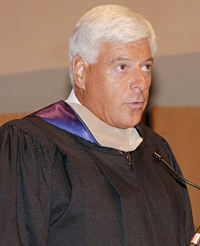 William C. Weldon, chairman and CEO of Johnson & Johnson, delivered the EMP commencement address. "Avoid asking, 'what's in it for me?'" he advised. "Do the right thing with a sense of giving back, and take the essence of the Kellogg brand: Leadership, Opportunity, Values and Ethics," the first letters of which spell out "LOVE." Dennis Paschedag EMP-53 and Charles T. Kinas EMP-54 echoed that theme in their addresses. The support of family and friends, they said, made it possible for them to get through a rigorous program that involved countless hours away from home. EMP-53 gave Top Professor awards to Sunil Chopra, IBM Distinguished Professor of Operations Management and Information Systems, and to Steven S. Rogers, Gordon and Llura Gund Family Professor of Entrepreneurship. EMP-54 gave Top Professor awards to Anne Coughlan, associate professor of marketing, and to Sergio Rebelo, the Tokai Bank Distinguished Professor of Finance.